At a little after 5 o’clock this morning I thought I heard a beep. However, I was only half awake and so I determined that I had dreamed the beep. Beep. There it is again. Why am I dreaming a beep noise? Beep. Ugh, okay. I will sit up and if I hear it again, I know I am not hearing things. Beep. Joshua, wake up, something is beeping. Beep. 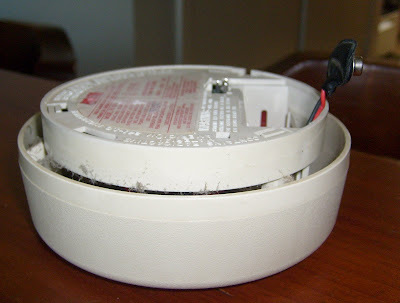 Josh, “it is just the smoke detector.” And he rolls back over. Um, we have been married for almost ten years and you think this is the end of it? No, sir, it is not! So, I get up and stand under the smoke detector in our room and wait. Beep. No, Josh, I really do not think that is it. Loosely translated, get up and make it stop! So, I go looking around the house. Beep. Okay, so it is the smoke detector in the hallway. And by the way, I am now realizing that the writers of FRIENDS are not as creative as I thought. The stupid things do just continue to beep. Poor Pheobe, I am starting to feel her pain. So, Josh is now out of bed and messing with the smoke detector trying to get it apart. Beep. Ugh, this is really annoying and now Josh is annoyed that he cannot get the thing apart while standing on the floor. Now standing on the chair he is still messing with it and for some reason, I decide that I should give instructions from the ground and that this is a good idea. Nope, not really. Josh is getting perturbed with me now. Beep. Goodness gracious, get that stupid thing apart!! Okay, Josh has it apart and the battery is out. A 9 volt?? Who the heck has a 9 volt laying around the house? Not the Stewarts that’s who!! So, Josh puts the detector on the shelf, I say thanks, and take the chair back to the kitchen. I get back to our bedroom. Beep. Did that thing just beep? Josh, “yes, it sounds like it.” And he is back in bed!! Beep. Oh my gosh, it is like I am living in a ridiculous comedy! Our house is by no means huge, but not small either. I believe that if I take it to the far end of the kitchen I will not be able to hear it in the bedroom. Beep. Back in bed, finally, I am tired. beep. REALLY?? Are you kidding me, I can hear that stupid thing beeping?!?! And now Josh is snoring. How can he already be back in bed and snoring? And now, to make matters worse, I need to go to the bathroom. Beep. UGH!!!! While in the bathroom, I realize I can no longer hear the beep. I am not lying I am now considering making a pallet on the bathroom floor and sleeping in here. While I am thinking of sleeping on the bathroom floor, I suddenly realize that this stupid comedy I am living in, The Stewarts, Episode: BEEP, has a sound track. I hear Carrie Underwood singing, you stole my happy….. You are darn right, that stupid beep has stole my happy of sleeping on a Saturday morning!!! Back to bed, again. Beep. Seriously, I am tired. However, I am now reminded that my wonderful husband is already back asleep and snoring. Snoring….I never thought I would say this, but thank you God for the snoring. If I move a little closer to him the snoring is drowning out the beep. Beep. Aww…..and now King George is starting to sing. Thank you Joshua and Kind George for the sweet sounds to put me back to sleep. Beep.